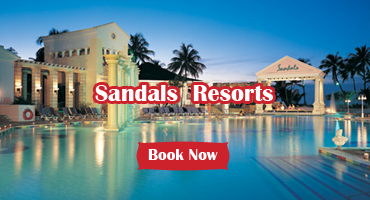 Designed specially for families, golf lovers and active travelers seeking an all-inclusive tropical vacation, this appealing resort offers gracious amenities, enjoyable services and a wide variety of things to see and do. 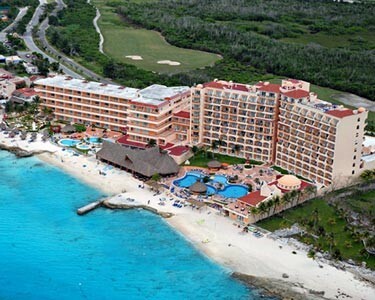 Here guests enjoy access to two, white-sand beaches, an 18-hole mini-golf course, traditional restaurants and bars, a nightclub and a supervised activities program just for kids. Whether you spend lazy days relaxing by the pool; work on your swing at the par-72 Nicolas Design Group golf course located across the street or take advantage of the bicycle tours, snorkeling and scuba diving lessons offered at the resort, there is something for everyone at this dynamic Mexican retreat. Services Non smoking rooms: Some Rooms Bag Check: Yes, Complimentary Courtesy Room: Yes, Complimentary Cribs Available: Yes, Complimentary Internet Access: No Pets Allowed: No Rollaway Beds: Yes, Complimentary Safe Available: Yes, Complimentary Adult Only: No ATM Available: No Concierge: Yes Porter: Yes 24 Hour Front Desk: Yes Gift Shop: One Gift Shop Housekeeping: Daily Wake Up Call: All Rooms Atmosphere: Both Active And Relaxed Hotel Appeal: All Business Center: No Room Service: Yes Baby Sitter Access: Yes, Fees May Apply Laundry: Yes, Fees May Apply Self Parking: Yes, Complimentary Valet Parking: No Fireplace In Rooms: No Fireplace In Lobby: No Handicap Accessible Rooms: No Amenities Air Conditioning: All Rooms Alarm: None Cable or Satellite TV: All Rooms Coffee or Tea Maker: None Cookware: None Dishes: None Dishwasher: None DVD Player: None Hairdryer: All Rooms Hot Tub: None In Room Safe: All Rooms Internet: No Ironing Board: None Kitchen In Room: None Kitchen refrigerator: None Microwave: None Mini Bar: No Modem Dataport: No Newspaper Delivery: None On Demand Movies: None Outdoor Furniture: No Outdoor Grill: No Patio: No Refrigerator: All Rooms Robes: None Stove: None Telephone: All Rooms Television: All Rooms Tub or Shower: Shower Only VCR Player: None Video Games: None Washer Dryer: None Bedding Description: 2 doubles or 1 king size bed Room Policy Description: Occupancy limits – 2 adults, 0 children, 2 total No children allowed in this category. Room Description: Deluxe Room Amenities Description: These are suite sized rooms with an ocean view; there is no division between the room and sitting area. Air Conditioning: All Rooms Alarm: None Cable or Satellite TV: All Rooms Coffee or Tea Maker: None Cookware: None Dishes: None Dishwasher: None DVD Player: None Hairdryer: All Rooms Hot Tub: None In Room Safe: All Rooms Internet: No Ironing Board: None Kitchen In Room: None Kitchen refrigerator: None Microwave: None Mini Bar: No Modem Dataport: No Newspaper Delivery: None On Demand Movies: None Outdoor Furniture: No Outdoor Grill: No Patio: No Refrigerator: None Robes: None Stove: None Telephone: All Rooms Television: All Rooms Tub or Shower: Shower Only VCR Player: None Video Games: None Washer Dryer: None Bedding Description: 2 doubles or 1 king size bed & sofa Room Policy Description: Occupancy limits – 4 adults, 2 children, 4 total Maximum of 2 children through the age of 4 stay free in existing beds with at least 2 adults. Children 5-12 are surcharged. Maximum of 2 children through the age of 12 stay free in existing beds with at least 2 adults. (Jan 3, 2012 – Feb 10, 2012) (Apr 15, 2012 – May 31, 2012) (Aug 12, 2012 – Dec 21, 2012) Room Description: Oceanview Room Amenities Description: All rooms include private balcony or terrace. Rooms in the South Tower are regular superior size and offer ocean view. Air Conditioning: All Rooms Alarm: None Cable or Satellite TV: All Rooms Coffee or Tea Maker: None Cookware: None Dishes: None Dishwasher: None DVD Player: None Hairdryer: All Rooms Hot Tub: None In Room Safe: All Rooms Internet: No Ironing Board: None Kitchen In Room: None Kitchen refrigerator: None Microwave: None Mini Bar: No Modem Dataport: No Newspaper Delivery: None On Demand Movies: None Outdoor Furniture: No Outdoor Grill: No Patio: No Refrigerator: None Robes: None Stove: None Telephone: All Rooms Television: All Rooms Tub or Shower: Shower Only VCR Player: None Video Games: None Washer Dryer: None Bedding Description: 2 double beds or 1 king size bed Room Policy Description: Occupancy limits – 4 adults, 2 children, 4 total Maximum of 2 children through the age of 4 stay free in existing beds with at least 2 adults. Children 5-12 are surcharged. Maximum of 2 children through the age of 12 stay free in existing beds with at least 2 adults. (Jan 3, 2012 – Feb 10, 2012) (Apr 15, 2012 – May 31, 2012) (Aug 12, 2012 – Dec 21, 2012) Room Description: Gardenview Room Amenities Description: These rooms are in the North Tower (the original building).